Unless you had a second Thanksgiving dinner (like we did), you're likely out of turkey by now. But you may have a little rich brown turkey stock in the freezer. But, don't you usually say to yourself, or aloud, that you should cook turkey more than once a year? You probably can still buy a whole frozen turkey and cook a week or two from now. Or just pick up a whole fresh turkey breast, roast it and thaw some of that delicious stock. Then make this soup. I've been trying for years to make a decent soup with turkey leftovers after Thanksgiving. Some have been good, maybe even a little better than that. But none have ever been excellent until I accidentally hit on this one last night. It's right in line with my frequent advice to rely on fresh herbs, but also is very, very east to make. I didn't realize how easy until I just wrote it down now. So, give it a try, or file it away for next year. 1/3 cup dry sherry, such as Amontillado or Fino - do NOT use "cooking sherry" from the grocery store - you'll poison your palate and be scarred for life. Saute onion, carrot and garlic until slightly softened. Season lightly with kosher salt and fresh ground pepper. Add stock and herbs, bring to a boil. Reduce heat, check seasoning and simmer 15 minutes. Add sherry and simmer 2-3 minutes. Dear god, that sounds like a headline from Cooking Light magazine or something. Sorry about that. The recipe is very easy to make, with surprisingly little time and effort. The rich stock will make several of your thanksgiving dishes richer and more tasty than ever. I use it in gravy, stuffing and for braised vegetables. It can save you a few dollars while massively increasing quality, compared to buying the ubiquitous cans of stock that suddenly appear en masse in the grocery stores in early November. You'll start the "thanksgiving kitchen smells" a few days early! Place turkey parts skin side down in a raosting pan. No oil or seasoning needed. Roast for 30 minutes, then turn peices over and roast another 20 minutes until golden brown. Transfer turkey parts to a large stock pot. Add vegetables to the fat in the roasting pan. After 10 minutes stir vegetables around and cook another 10 minutes, until golden brown. Transfer veg to stock pot. Place roasting pan on stove (use two burners) and add 2 cups water. Turn heat to medium high and scrape up brown bits until they are released from the bottom of the pan. Note: if there is excessive oil in the pan, drain some off before adding the water. Add the liquid and vegetables to the stock pot.. Add parsley stems, bay leaf, peppercorns, salt, and 4 quarts water. Bring water to 180 degrees and cook at that temperature for 3 hours. Do not let the stock boil. Pour stock through a Chinois or large strainer discarding solids. If you wish, strain the stock a second time using a layer of paper towel or cheesecloth. What Did You Think of the Show "Master Chef?" Many of you know that I was a finalist to appear on the reality cooking show Master Chef, with Gordon Ramsey. One step further and I would have been on TV. Auditions for the second season are underway, and the producers have even contacted me directly to try out again. What do you think? Many of you saw the show, with both it's ups and downs. I'm certain I cook as well as any of the finalist, or even the young winner. But, is it a show you'd like to see me on? Do you think it's worth the publicity - both positive and negative - to be associated with a show like that? I'm thinking it over. Let me know what you think......you can email me (Tom) at tmcguff@gmail.com. This dish is almost "stuffed chicken, only easier, because you don't have to carefully carve out pockets, nor flatten the chicken breasts. The only thing to pay close to is the done-ness and browning of the chicken. If you cooked the chicken for the complete 40 minutes that the tomatoes roast, you'd dry out the breast. Adding the chicken part way through cooking, then using the broiler for browning, solves these problems. The exact cooking times may vary based on the size of your roasting pan and specific of your oven. Just make sure the chicken is cooked through. If it's browned and beautiful too, it's a bonus. In the corner of the picture below you'll see fresh fava beans and peas with butter and lemon. Line a roasting pan with quarters of plum tomatoes, unseeded, and the yellow cherry tomatoes. Add 2 bay leaves, 3 thyme sprigs, 2 rosemary sprigs, salt, fresh ground pepper and olive oil. Add a splash of balsamic vinegar. Toss together. If fresh herbs are unavailable, substitute each sprig with a teaspoon of dried. Roast vegetables for 25 minutes. While vegetables roast, place chicken breasts in a large bowl, season with salt and pepper, then drizzle with olive oil and toss together. .
Slice each chicken breast lengthwise, being careful to not cut all the way through. Layer 2-3 slices of capicolla in this fold, then add a rectangle or two of mozzarella. See picture below to see uncooked breasts lined with capi and cheese. After vegetables have cooked 25 minutes, remove from oven and place the chicken breasts on top of vegetables and herbs, pocket facing up. Cook for another 15 minutes. Turn over to broil to slightly brown the tops of the chicken and capicolla and completely melt the cheese (it may brown a little). Serve over rice or pasta or with bread. In my last column I covered the herbs and spices I suggest you ought to have on hand in your spice drawer, spice rack or pantry. I'll follow up with a review of the pantry staples I think are most important to have. But, like you, I've been really busy lately with two teenagers and a grade schooler, swim meets, parties and just plain life as we know it. So before I go into another list / lecture about staple foods, I'd like to share a simple, simple technique for a one-pan meal that I've used several times during the past few hectic weeks. 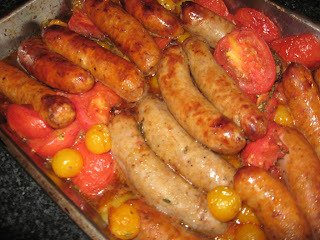 The technique comes from Jamie Oliver, and the idea is that you line a roasting pan with vegetables, herbs and seasonings, toss them in oil, then place a main ingredient over the top and roast for about 40-60 minutes depending on the main ingredient. While fresh herbs are the best choice for great results, you can use dried if that's all you've got. Substitute a little less than one teaspoon for each "sprig" of fresh herbs in the recipes that follow the next posts. Below you'll find a small gallery of photos of these dishes. In the next post, my recipe for the stuffed chicken. Next week, I promise, we'll discuss pantry staples. How exciting!! Well, it's exciting for me, and I hope for you too. I've had a busy and even unexpected schedule the past couple weeks - out of town job interviews, birthday parties, swim meets, gotcha day party (anniversary of adoption) and even a impromptu hole-in-one celebration (my second). All to say that I've not shared anything with you gentle readers for a couple weeks. The complaint department at BABC wasn't overloaded with outraged readers - so I appreciate your patience.